The nose is aromatic, medium-intense and, this might be my mind playing tricks here, “green” – meaning a grassy (but pleasantly so) top note. This fresh note is underpinned by vanilla-scented honey, honey melon, orange oil, shortbread, caramelized ginger, a dense mixture of spices, a pinch of white pepper and a smidgen of peat smoke. Loads of intermingled, hard to pin-down flavours in there – that’s the blending doing its work. The palate is light and soft on the arrival, almost silky, with a growing and fading spicy, dry, peppery, almost chili-like hotness appearing after a while, masking a somewhat flat and watery texture. Not as complex as the nose with, again, slightly grassy notes, diluted honey (more like honey melon water), a very dense dark-sweet mixture which is hard to describe, a hint of peat smoke, toasted cask and mixed spices. To be fair, it’s probably not designed to be dissected and held in the mouth but to be swallowed rather quickly and it does a fine job at that. Let’s leave it at that. The medium-intense, long finish is quite dry and, once again, slightly grassy-green upon swallowing, nothing sweet or fruity about it with a growing dryness towards the end. What an interesting experience. From a fruity and very interesting, complex nose to a slightly more dry mouthfeel and a rather crisp, dry finish. Yep, I can see this working very well as a “daily quaffer”, drunk without thinking about it too much or used in cocktails of all sorts. 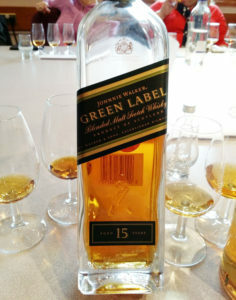 And, to be fair, that’s just what this Johnnie Walker Green Label is designed for. So, yep, there you have it. Did you try this new version? Any notes on how it compares to the old one? Let me know in the comments section below! the old version was less peaty and a bit sweeter.still have a bottle closed,when i open it i will send u a sample.